So the LORD said to Moses, "Take Joshua son of Nun, a man in whom is the spirit of leadership, and lay your hand on him. Have him stand before Elazar the priest and the entire assembly and commission him in their presence. 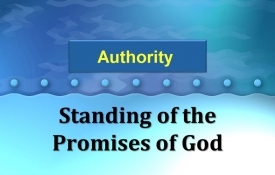 He is to stand before Elazar the priest, who will obtain decisions for him by inquiring of the Urim before the LORD. At his command they will come in. All Israel came together to David at Hebron and said. "We are your own flesh and blood. In the past, even while Saul was king, you were the one who led Israel on their military campaigns. And the LORD your God said to you, "You will shepherd my people Israel, and you will become their ruler." Therefore the Lord GOD said: "Look, I have laid a stone in Zion, a tested stone, a precious cornerstone, a sure foundation; the one who believes will be unshakable." Jesus shouted out passionately, "To believe in me is to believe in God who send me. For when you look at me you are seeing the One who send me. I have come as a light to shine in the dark world so that all who trust in me will no longer wander in darkness." "Because you have seen me, you have believed; blessed are those who have not seen and yet have believed." Jesus ordered us to preach and warn the people that God has appointed him to be the judge of the living and the dead. And not only us, but all the prophets agree in their writings that everyone who believes in him receives complete forgiveness of sins through the power of his name. But to the one who does not work, but believes on Him who declares the ungodly to be righteous, his faith is credited for righteousness. "See, I lay in Zoin, a stone that causes people to stumble and a rock that makes them fall, and the one who believes in him will never be put to shame." For the Scriptures encourage us with these words: "Everyone who believes in him will never be disappointed."